1. Soak chana overnight and pressure cook with little salt. Keep aside. 2. Heat oil in a pan add mustard, red chillies and curry leaf one by one and saute. Add onions and fry them till transparent. 3. Now add chopped bamboo shoot, salt and cover the lid. Cook for 10 minutes. 4. Add cooked chana and chilli powder, mix well. Cover the lid and again cook for another 10 minutes in low heat. 5. 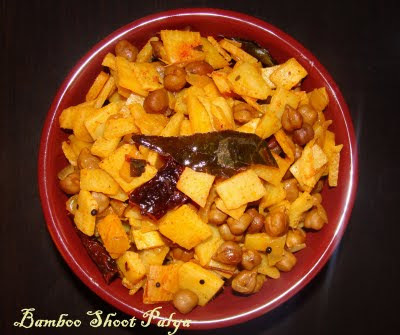 This dish is very tasty and goes well with rotti, chapati and dosa. Note: I used canned bamboo shoots. If you get fresh you have to slice it and soak it in water for 2-3 days (change the water daily) to remove toxins.